Join us for the nationally televised Harvard Yale Hockey Game from Madison Square Garden. 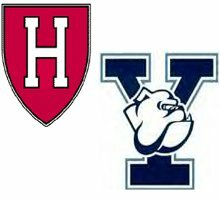 Yale won the Inaugural Rivalry on Ice 5-1 last January, but this year Harvard may be the favorite. Join us at Tobacco Road in Durham to cheer for Harvard. We are co-sponsoring the event with The Yale club. Back in 1900, Harvard and Yale played their first hockey game at the St. Nicholas Rink in New York City in front of a crowd of 2,000 dressed in black tie. Now America’s most storied collegiate rivals will return to where it all began as Madison Square Garden plays host to a special hockey game titled “rivalry on ice” between Harvard and Yale on January 10, 2015. Please RSVP using the form to the right.